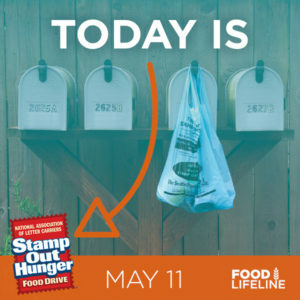 Stamp Out Hunger, the nation’s largest single-day food drive, is in it’s 27th year and is taking place here in Western Washington on Saturday, May 11! 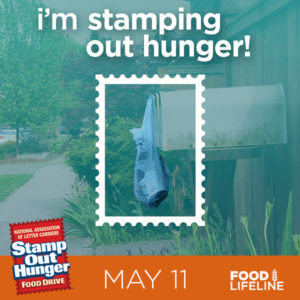 A blue Stamp Out Hunger bag will be sent to your home in early May. 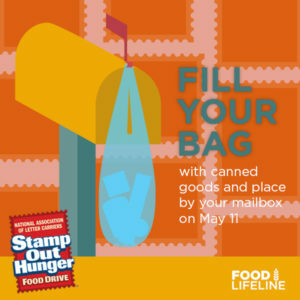 Fill the bag with non perishable food items and leave it by your mailbox for your postal worker on Saturday, May 11. Food from this drive helps Food Lifeline fill the shelves of more than 300 local food banks, shelters, and meal programs across Western Washington. 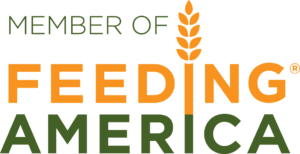 While one bag of food may seem small, a little goes a long way and Stamp Out Hunger succeeds every year thanks to the donations of generous neighbors like you! For every dollar you donate, Food Lifeline can create the equivalent of four meals for our neighbors in need. Click here to donate today! Stamp Out Hunger is a great Saturday volunteer opportunity for everyone ages 16+! 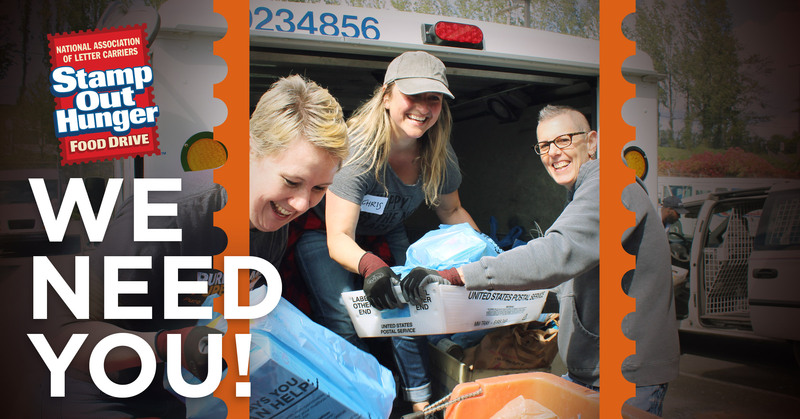 We’ll send you and your volunteer compatriots to a local post office where you can help load donated bags of food for our drivers to bring back to the Hunger Solution Center. The action takes place outdoors and requires some standing and lifting. Click here to sign up! Use these graphics on your Facebook, Twitter, or Instagram to let your friends know about Stamp Out Hunger!